Twitter is coming forward as the latest site to be hacked. The social network said in a blog post Friday afternoon that approximately 250,000 user accounts were potentially compromised, with attackers gaining access to information including user names and email addresses. The company first detected signs of an attack earlier in the week, which led to an investigation and the discovery of a larger breach. "This week, we detected unusual access patterns that led to us identifying unauthorized access attempts to Twitter user data. We discovered one live attack and were able to shut it down in process moments later," said Bob Lord, Twitter's director of information security, in a post. "However, our investigation has thus far indicated that the attackers may have had access to limited user information." More than half of the students implicated in last year's cheating scandal at Harvard University have been required to withdraw from school for a period of time, a dean said in a statement Friday on behalf of the school. More than a hundred students were investigated for plagiarism or for having "inappropriately collaborated" on a course's take-home, open-book spring final exam, said Michael D. Smith, Harvard's dean of the Faculty of Arts and Sciences. Many of those who were not forced to withdraw face disciplinary probation at the Ivy League institution in Cambridge, Massachusetts, and the remaining were cleared. The school would not release the specific breakdown of the numbers of affected students. The voice on telephone messages left for Manti Te'o matches that of the 22-year-old man who says he posed as a woman in carrying on a relationship - by e-mail and over the phone - with the Notre Dame linebacker, according to the "Dr. Phil" show. "They all say, with scientific certainty, that Ronaiah Tuiasosopo is the female voice in those recordings," host Phil McGraw said, citing conclusions by forensic voice analysts with three independent contractors. That conclusion supports Tuiasosopo's assertion that, posing as a woman, he was involved in a relationship with Te'o, who had not known that his love interest was a man. Te'o rose to prominence while leading Notre Dame's Fighting Irish to an undefeated regular season. This year's Heisman Trophy runner-up, he told interviewers in September and October that his grandmother and girlfriend, whom he described as a 22-year-old Stanford University student, had died within hours of each other. The Texas prosecutor shot to death in broad daylight outside a courthouse had feared for his life and carried a gun to work, according to a Dallas attorney describing herself as his friend. Colleen A. Dunbar told CNN that she spoke with Kaufman County Assistant District Attorney Mark Hasse on January 24, and he told her he began carrying a gun in and out of the county courthouse on a daily basis. Hasse was gunned down in the parking lot while going to work Thursday. Investigators on Friday were reviewing his caseload for possible clues about what led to his killing. "He told me he would use a different exit every day because he was fearful for his life," Dunbar told CNN. She said that Hasse offered no specifics on why he felt threatened, but only that he did. Dunbar said she was "shocked" by the killing. 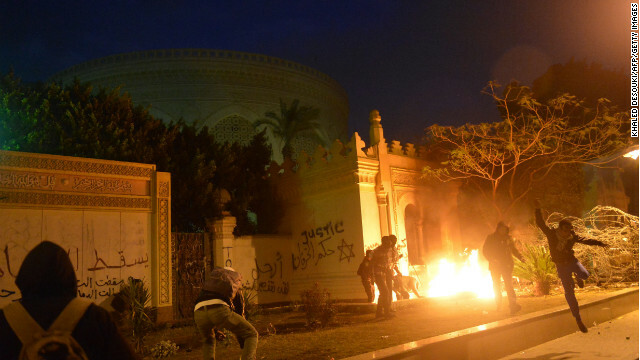 A fire burned at the entrance of Egypt's presidential palace in Cairo on Friday night as protesters hurling rocks and Molotov cocktails battled with security forces firing tear gas and water cannons. Egypt has been rocked by violence since last week's two-year anniversary of its 2011 revolution. Protesters have been angry over the slow pace of change and recent edicts by President Mohammed Morsy, who imposed a 30-day curfew on areas engulfed by violence. [Update, 1:54 p.m.] A woman has been arrested in a bomb threat that caused the evacuation of the Oklahoma state Capitol, the Oklahoma Highway Patrol told CNN affiliate KOCO. No devices were found and staff and visitors were allowed back inside, KOCO reports. [Original post, 12:53 p.m.] The State Capitol building in Oklahoma City, has been evacuated due to a suspicious item, Captain Dexter Nelson with Oklahoma City Police said. 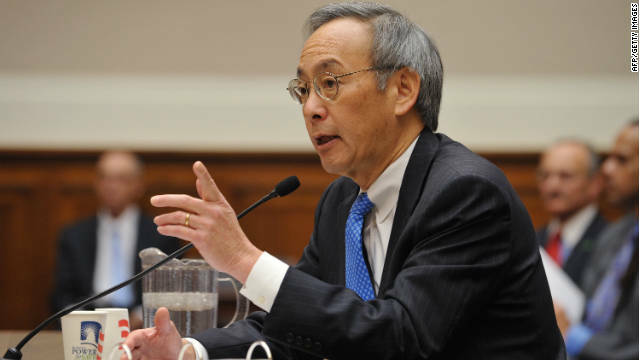 Energy Secretary Steven Chu is resigning, a Democratic official confirmed to CNN today. The Obama administration has approached a number of elected officials about taking the job but they’ve declined. For more on this story, go to CNN's Political Ticker. A day after an explosion rocked its offices in Mexico City, Mexico's state-run oil giant Pemex says it's too early to speculate on the cause of the deadly blast. 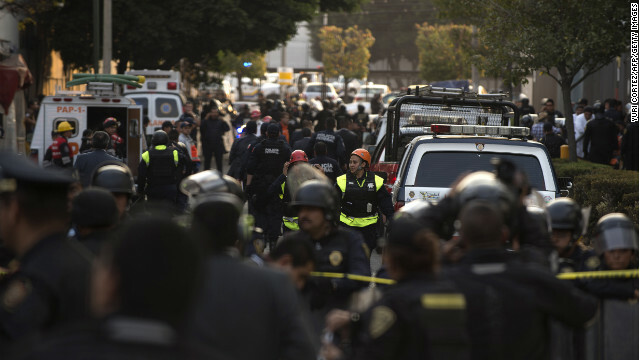 At least 32 people - 20 women and 12 men - were killed in the explosion, Pemex chief Emilio Lozoya said at a news conference Friday. More than 100 were injured, including 52 who remain hospitalized. [Updated at 11:59 a.m. ET] Istanbul police identify the bomber as Ecevit Shanli, a member of DHKP-C, a Marxist-Leninist terror group. [Updated at 9:19 a.m. ET] U.S. State Department spokesperson Victoria Nuland issues a statement on the attack: "We can confirm a terrorist blast at a checkpoint on the perimeter of our embassy compound in Ankara, Turkey, at 1:13 p.m. local time. We are working closely with the Turkish national police to make a full assessment of the damage and the casualties, and to begin an investigation. We will share more information as it becomes available." [Updated at 8:10 a.m. ET] The person killed in the bombing outside the U.S. embassy is a Turkish embassy guard, a senior U.S. official tells CNN. Two other people were wounded and neither is American, the official said. [Updated at 7:38 a.m. ET] The blast happened shortly after 1 p.m. local time. The U.S. Embassy would normally be open for business at that hour, CNN's Ivan Watson reports. [Updated at 7:31 a.m. ET] Video from the scene shows ambulances in the streets near the embassy. Security forces have closed off the area. U.S. officials have been unable to confirm details of the attack. [Updated at 7:20 a.m. 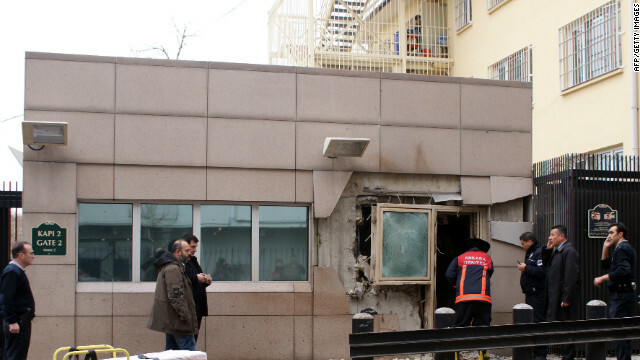 ET] Images from CNN sister network CNN Turk show a hole in a wall of a building across the street from the U.S. Embassy in Ankara, Turkey. [Updated at 7:05 a.m. ET] One person was killed and two others were wounded by a suicide bomber who blew himself up outside the U.S. Embassy in Ankara, according to Ankara police. [Posted at 6:45 a.m. ET] CNN is working to confirm reports of an explosion near the U.S. Embassy in Ankara, Turkey. Turkey's semi-official news agency Anadolu is reporting the blast. Ambulances arrived to pick up injured people, the report said. The jobs recovery continued to crawl forward in January, as employers hired 157,000 workers, the Labor Department said today. Job growth at that level is weaker than in December, when employers added 196,000 jobs. 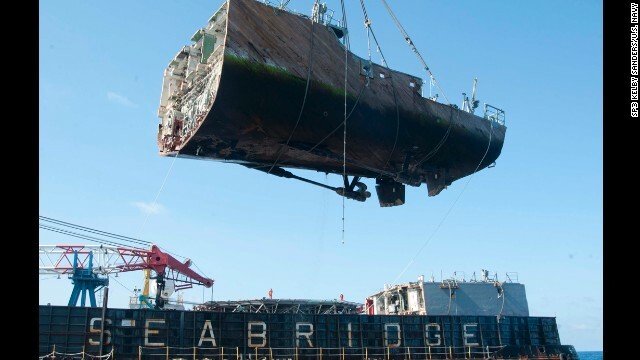 For more on this story, go to CNNMoney here. 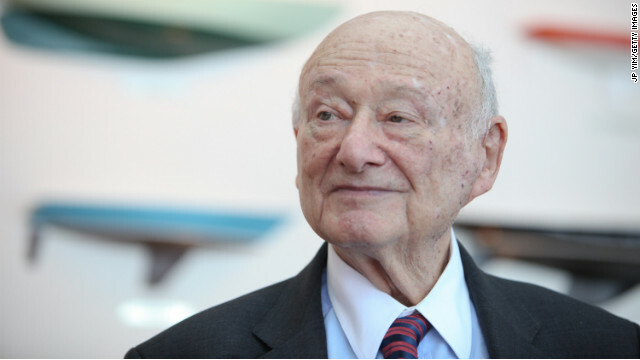 Ed Koch, the brash former New York City mayor who typically greeted constituents with a "How'm I doin'?" died Friday at the age of 88, his spokesman said. 10:00 am ET - NASA remembers fallen astronauts - On the 10th anniversary of the Space Shuttle Columbia tragedy, NASA pays tribute to the crews of Columbia, Challenger and Apollo 1 during the agency's Day of Remembrance.